You know the basics of Excel 2016, but you're ready to move on to creating charts, formulas, and more - this Excel 2016 Intermediate course is for you. Learn by Doing! Michael Jordan didn't become an NBA star by watching basketball on TV; this course is completely interactive - it recreates the experience of actually using Microsoft Excel 2016! Each bite-size lesson also includes a step-by-step illustrated courseware reference. CustomGuide is used by thousands of the world’s most demanding organizations, including Harvard University, Facebook, and the U.S. Senate. A browser that supports either HTML5 or Adobe Flash. Third party cookies must be enabled. For an optimal experience the screen resolution should be at least 1024x640 pixels. 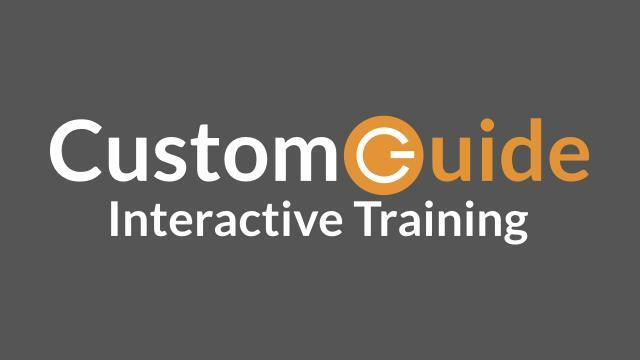 CustomGuide is a leading provider of interactive training and skills assessments.